Lily is a 4 wheel drive robot with five inch tire, to make climbing easy. The back tires are high traction to help with grip going up the ramp and the front are low traction to make turning easy. We have adjustable block guards that allow us to easily clear blocks as well as climb the ramp. In autonomous we score the climbers in the basket and drive onto the low zone of the ramp. During Tele-op we can clear the base of the ramp and push blocks into the floor goal. During end game we can hang in 18 seconds using our two motor tape measure design adjusted with a linear servo. Once the robot is hanging we can swing our climber scoring mechanism to get the all clear signal. On the way up to hang we can get the zipliners. What to say about a short trip to a huge country? We saw a small part of China, and it was sooo interesting! Beijing traffic, Beijing air, the Great Wall, a train trip to Xian and the Terracotta Army, the Plank Walk on Mt. Hua Shan…. 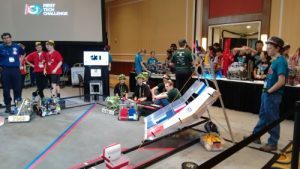 And of course we were at the World Adolescent Robot Contest, one of six international teams participating in a demonstration FTC tournament. We made new connections, appeared on Chinese TV (! ), got glimpses of several other robot competitions that were being showcased, and had a chance to check out the industrial robot exhibition which was running at the same time. Our robot had some challenges, but the last two matches went better. Although Lily’s autonomous programs didn’t succeed, we made up for it in Tele-Op. We weren’t chosen for a final alliance, so we got to cheer for all the teams. 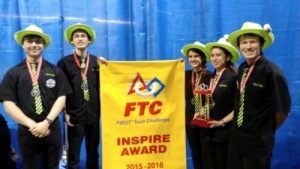 The award ceremony was exciting, with 3491 FIX IT being nominated for the PTC Design, Control(programming), and the Connect Awards. 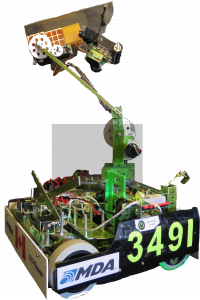 We were amazed when the announcer called out 3491 FIX IT for the Inspire Award! Lily and the team had a great time at the World Championships! Our matches didn’t go as well as we’d hoped but we had fun nevertheless! Autonomous never quite succeeded and Lily had a few mechanical and electrical issues. On the day without such issues, however, Lily performed admirably! We ran a contest for the other teams at the competition: the teams would give us a piece of advice for rookie teams. We then gave linear actuators to the tips we thought were the best! Next year, we plan to give these tips to the new BC teams. 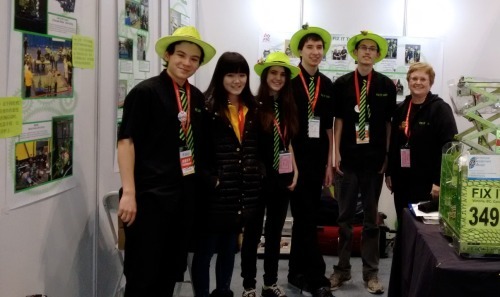 At the Award’s ceremony, we were nominated for the Control Award despite our autonomous programs never having worked! Next year, autonomous will work!